Avast, ye salty sea dogs! The company I work for is taking a couple of hours out of the middle of the day today to go hang out on a boat in the middle of Lake Michigan. Free food, free drinks, free seasickness. It should be good times. If anything embarrassing happens, I will let you know. I do appreciate the fact that my job does the occasional company outing. The last outing was Whirley Ball, which is a combination of basketball, lacrosse and go-carts. Good times were had by all. It almost made me forget that I was a low-level project manager who types emails all day for a living. 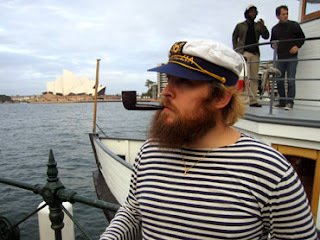 One of my coworkers accidentally stumbled across this picture of me sailing to Sydney, Australia. This was, of course, back in my short lived days as a pirate. I thought those times were behind me. Yet here I am, at the start of my new life as a "land lubber" and already the memories are welling back. Maybe some day I'll be willing to part with a few of those tales. Maybe I'll write a memoir. Who knows, if you buy me a mug of grog or two, I might be willing to spin a tale for you. It'd have to be really good grog.